I'm watching the classic Doctor Who episodes because ... I forget why, but I've started, and doggone it, I'm gonna see it through. 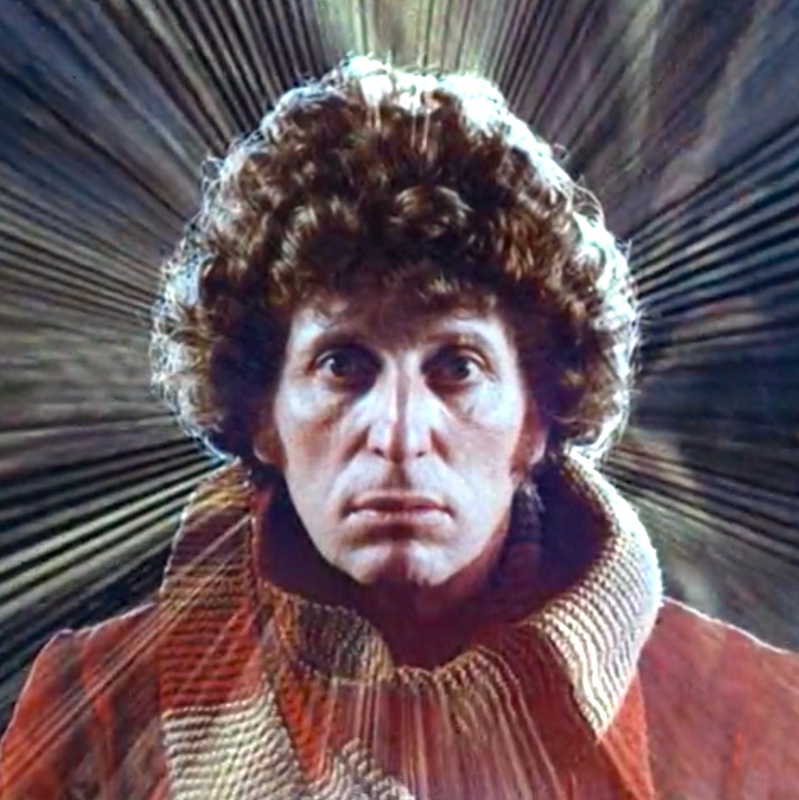 I'm up to Season 12 now, and that means Tom Baker as The Doctor. The 12th season was only 20 episodes long, comprising five serials. The first serial, Robot (4 episodes), indicated just how much the show changed over the first 12 years. The show was very serious when it began, with the occasional bit of levity. Patrick Troughton brought more humor to the show, as did Jon Pertwee. But right off the bat, Tom Baker was a clown. Literally. When The Doctor awoke following his regeneration, and changed clothes several times, including once coming out of the TARDIS as a clown. And, the odd getup that Baker was known for wearing was the least strange of the outfits he was trying on at the time, so the Brigadier told him it was fine and hurried him to investigate the case they had. That serial also introduced the character Harry Sullivan (Ian Marter), who would travel with The Doctor and Sarah Jane Smith (Elisabeth Sladen) for the remainder of the season. A season-long arc (or remaining season arc) began in The Ark in Space (4 episodes). Arc. Ark. Get it? The Doctor and his companions travel to space station Nerva (the aforementioned "ark") in the far future and save the day. The ending leads directly to The Sontaran Experiment (2 episodes), which featured the Sontarans, the second but nowhere near the last of appearances by that group of bad guys. Tom Baker broke his collarbone during the taping of The Sontaran Experiment, but that big, stupid scarf hid the brace he had to wear. So, +1 for the big stupid scarf. At the conclusion, they try to get back to Nerva and the TARDIS, but the Time Lords intervene and send them on an impossible mission against the Daleks. They'd spend the rest of the season trying to get back to Nerva. The serial Genesis of the Daleks (6 episodes), tells of, well, the genesis of the Daleks. We meet Davros for the first time. He's the dude that created them. He's stuck in a Captain Pike-mobile, but can talk. He does have a flashing light, though. In a mission doomed to failure, The Doctor (Tom Baker) goes back to the time of the creation of the Daleks, in order to change history. Apparently, The Doctor (Tom Baker) forgot that The Doctor (William Hartnell) told Barbara in Season One's The Aztecs that history can't be changed ("Believe me, I know!"). That ends with a return to Nerva, but at too early a time. They battle the Cybermen in Revenge of the Cybermen (4 episodes). The Cyberman hadn't appeared since Season Six's The Invasion, excepting a brief cameo in Season 10's Carnival of Monsters in which they played no role. There is a plot hole big enough to drive a TARDIS through in that serial. Gold is poisonous to Cybermen. Yet, some Cybermen land on a planet that's made of gold (or has it lying around all over the place). Remember that after first meeting then battling the Cybermen in Season Four's The Tenth Planet, The Doctor (William Hartnell) died and renewed? Well, during this serial that reintroduced the Cybermen, between the broadcast of episodes one (19 April 1975) and two (26 April 1973), William Hartnell actually died (23 April 1975). On that sad note, Season 12 ended, and The Doctor and his companions entered the TARDIS to head to Season 13. As shall we. Thank you again, Basil! I've said that in the past, so count that as time travel. This installment confirms why I didn't get on board with Dr. Who. I don't mind stories that increase in complexity arithmetically, but shun those that do so exponentially. Go for baroque and you lose me. I wonder if that scarf gets itchy in climates that are, y'know, not cold. So, what's your favorite season so far? Well, that's kinda hard to say. But, of the first 12 seasons, I'm going to say Season One. It introduced me to The Doctor. Though I had seen some Tom Baker and Peter Davison episodes many years ago, I finally met The Doctor when I watched An Unearthly Child. From my Baker-Davison experience, I thought the Daleks were stupid. They were presented properly in Season One, allowing me to understand they were more than kitchen utensils yelling "Exterminate!" And, 35 of the 42 episodes still exist (well, 33, but BBC animated two of the missing ones). It was truly The Doctor traveling through history (Marco Polo, Aztecs, French Revolution). I enjoyed it. Season One is the most complete of the seasons starring William Hartnell, and William Hartnell was, and is, The Doctor. All the others are just different sides of his personality. Well, to me, anyway.